I have some free time this week and decided to watch a movie that has been on my list for a while, and after the fact noticed that it fit (sort of) into my watching resolution list. 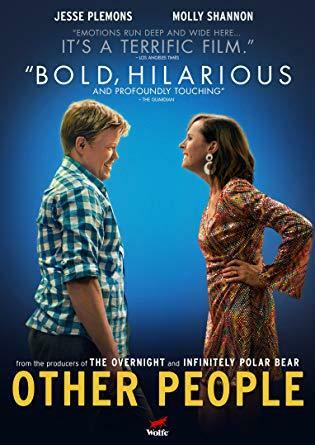 2016’s comedy-drama, heavy on the drama, Other People is not officially an autobiographical film, but is heavily based on writer and director Chris Kelly’s life and his mother’s battle with terminal cancer. So on the list it goes! I feel like “dying family member” movies are a strange little subgenre of their own with a lot of the same beats and very often semi-autobiographical. I suppose there is something about a story like this that only comes from someone who has endured it. David, played by Jesse Plemons, moves home from NYC to Sacramento for a year while his mother slowly, painfully dies of cancer, and he has to navigate his own feelings and his complicated relationship with his family. David came out as gay nine years previously and was rejected back then, which has since evolved into a tentative truce and a lot of unspoken resentment. I did appreciate that the coming out part of the story was so far in the past, as it let the film explore some new territory in these types of stories, the tension that can remain after all the big emotions have spilled over. This movie is not going to blow your mind or change your heart, but it does feel like a very real, personal story about a family and tragedy, one that I’m sure it was powerful for Chris Kelly to make. It’s a bit slow, not everything works, but if you’re in the mood for a straight shot of emotions, there are far worse ways to spend your time.